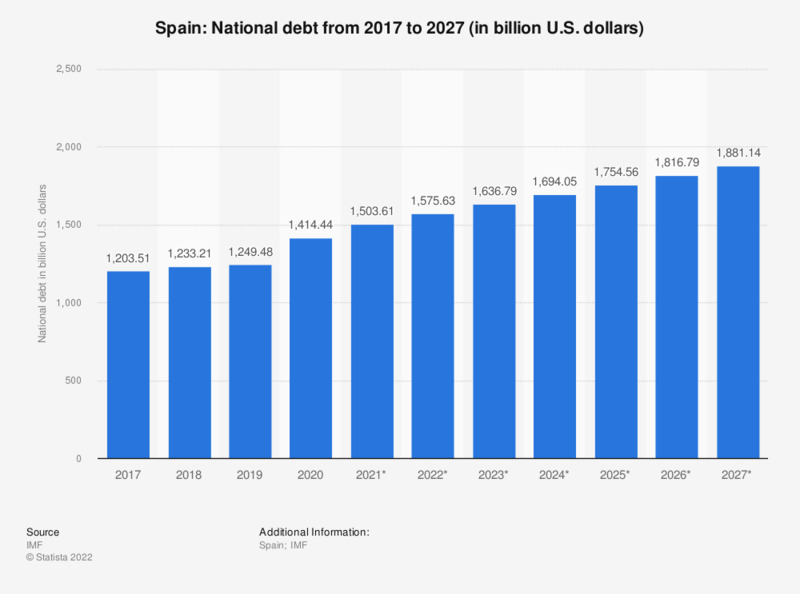 This statistic shows the national debt of Spain from 2012 to 2017, with projections up until 2022. In 2017, the national debt in Spain was around 1,295.15 billion U.S. dollars. For comparison, the Greek debt amounted to approximately 317 billion euros that same year. The Spanish economy, though in a state of turmoil, has been one of the world’s largest and most important economies. As a member of the European Union and the World Trade Organization, Spain often plays an important role in modern day economics. Spain maintains several economic strengths, some of which include a modern high-tech infrastructure as well as an abundance of exports, which rank as some of the highest in the world. Additionally, Spain’s economical sectors, principally built upon tourism and automobiles, also rank amongst some of the most significant around the globe. Tourism plays an important role in Spain’s economy, with millions of tourists visiting the plentiful amount of beaches during the summer and historical sites all year round. In the past, Spain was considered the most frequently visited country in the world, however, it fell several places in the past couple years, primarily because of the country’s ongoing economical struggles. Tourism is arguably the most significant sector in Spain, making up a large percentage of the country’s entire GDP. The Spanish automobile industry has receded for several years,but still makes notable contributions to the economy and has some of the more powerful car manufacturers in the world.